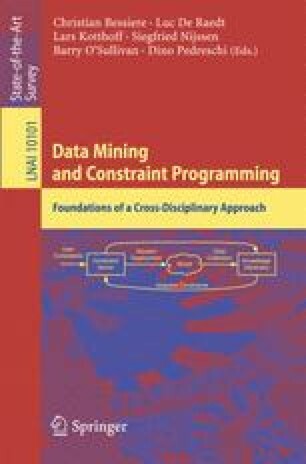 MiningZinc offers a framework for modeling and solving constraint-based mining problems. The language used is MiniZinc, a high-level declarative language for modeling combinatorial (optimisation) problems. This language is augmented with a library of functions and predicates that help modeling data mining problems and facilities for interfacing with databases. We show how MiningZinc can be used to model constraint-based itemset mining problems, for which it was originally designed, as well as sequence mining, Bayesian pattern mining, linear regression, clustering data factorization and ranked tiling. The underlying framework can use any existing MiniZinc solver. We also showcase how the framework and modeling capabilities can be integrated into an imperative language, for example as part of a greedy algorithm.